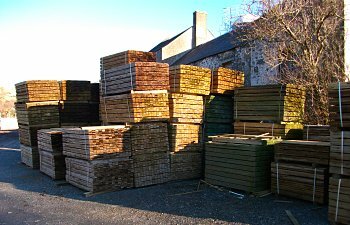 J & W Dunlop welcome you to Garnaburn Sawmill supplier of Timber and Fencing products to South West Scotland. We are a family run business, established in 1832, situated at Colmonell in the Stinchar Valley, South Ayrshire. We serve customers throughout Ayrshire, Wigtownshire and South Lanarkshire. Garnaburn Sawmill supplies all types of fencing and building timbers to the agricultural, industrial and domestic markets – both Retail and Trade. All our timber is pressure treated unless otherwise requested. We have a regular stock of standard timber sizes. See our current Price List. Gates, wire and fencing accessories. Timber gates, garden sheds, etc manufactured here. Special orders can be cut to required sizes. If you want fences erected we can recommend professional contractors. Suppliers of Rutland Electric Fencing and Oregon parts. Orders can be collected or deliveries arranged throughout Ayrshire, Wigtownshire, south Lanarkshire and south west Scotland. See our current Price List. Click on the thumbnails to view larger image.